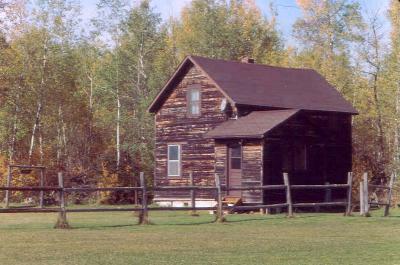 Early on the morning of Sept. 23, 2001 three of us began our journey from Baudette, MN to the Wallace Lake Recreation Area in eastern Manitoba. Our plan was to travel by canoe up the Wanipigow River into Woodland Caribou Provincial Park in Ontario. In preparation we had obtained our permits to camp in Woodland Caribou from the park headquarters in Red Lake, Ont. We were able to do this by phone and have them mailed to us. 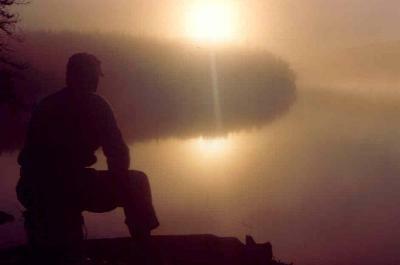 At this time there is no permit required to camp in Atikaki Provincial Park in Manitoba. The river we would travel forms the southern boundary of this park. The Manitoba Parks require a parking permit that can be purchased where licenses are sold but since the recreation area is not part of the park it was not required. If we had decided to enter through Garner Lake in Nopiming Provincial Park we would have needed the annual parking permit. We traveled up Hwys.. 308 and 11 to Lac du Bonnet where we took 313, 315, 314 and 304 to Wallace Lake. The roads were good except for about 20 miles in Nopiming that had a lot of washboard. We did the 270 miles in 6 hours. On the return we went west on 304 through Bissett and Manigotagan. There was less gravel this way and not counting the time eating a great meal near Pine Falls we made the 295 miles in a little less time. It also gave me a chance to check out Bissett as we are planning a fly-in canoe trip for next year and the bed and breakfasts and float plane base there may be used. When we arrived at Wallace Lake I was surprised at all the activity for so late in the season but soon found out why. Moose hunting season was really going strong with the cold crisp nights they had been having. We talked with a few moose hunters about water level conditions on the river and they told us that there was plenty of water for a canoe to get through. My research had shown that it was best to take the one mile portage from Wallace to Siderock Lake but the locals told us that the river was the way to go. I had visions of endless meandering in a swamp but they said it was not bad at all. 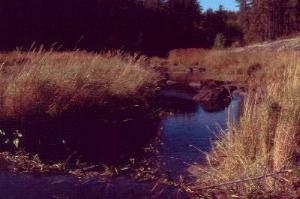 They also made sure that we knew how to find the river channel when we had crossed Siderock Lake. There instructions about that saved us a lot of trouble the next day. It took us two and a half hours of easy paddling to get to the middle of Siderock Lake. We were very thankful for all the friendly advice we had gotten at Wallace Lake. To start a trip with a mile long portage is not fun. The travel up the river was very scenic with the fall colors well under way in the area. Of course there were a few beaver dams to go over but nothing too hard. We stopped for a break about one hour from the vehicle and it would have made a great camp spot if needed. When we pulled in for a rest on Siderock Lake on a point a mile southeast of the river exit we were surprised at what a great camp spot it was. We just looked at each other and knew that we were going no further that day. It was only three in the afternoon and now we could lay back and enjoy the beauty of the lake. 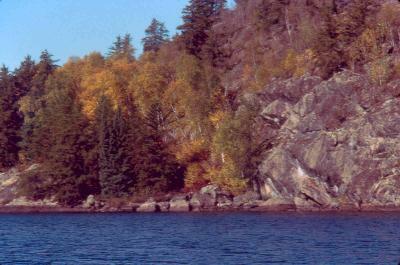 The golden leafed trees really enhanced the high rock wall that ran along the south shore of the lake. Our camp provided us with a great view of the sunset over that wall. Soon after we were all in our sleeping bags getting the rest we would need for the nest days push up the river. When I awoke during the night a number of Great Horned Owls were hooting and the Northern Lights could be seen as shafts jutting up from the dark horizon. Monday morning our chef treated us to French toast with real Maple syrup. It was a fine meal at the start of another fine cloudless day. At 9:00 we set off to find the river channel entering the east end of Siderock Lake. We had been warned that you could not see the channel from the lake. It is hidden behind vegetation that protrudes out into the middle of the eastern shore. We were told to look for the highest grass in the middle of that shoreline and paddle through the other vegetation towards it. By doing that we came right up on the narrow channel flowing between two grassy banks. Be sure to stay in the middle and not get tricked by the open water on either side of the vegetation protruding out into the lake. A few beaver dams helped raise the water level but we still had to do some hard poling and pushing with our paddles to get the canoes up to a portage about one mile from the lake. Before the trip I had taken UTM coordinates from a 1:50000 scale topo map (52L14) and entered them into my Garmin 3plus GPS. I used the GPS in this area to make sure that we did not get on the wrong creek in this area. 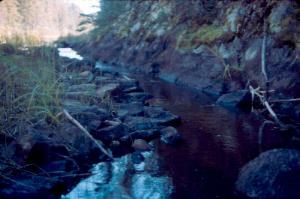 The creek I was concerned about could not be seen entering the Wanipigow. The valley it came through could be seen but not the stream itself. There are five portages necessary when the water is this low to get to the Woodland Caribou Park boundary. The second and third may be avoided when the water is higher. 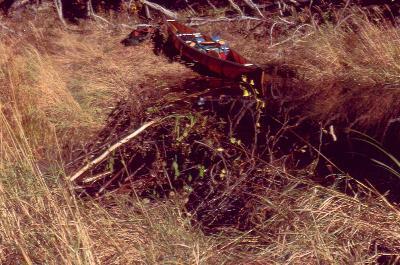 The first portage is located at U 15 0345421 5650199 and is about 100 meters long. After this portage we did a lot of walking while pulling our canoes along behind. As we walked we would bend over and pitch the rocks out of the channel so that on the return we could possibly paddle through. Most of the time there was a sandy bottom which provided for good walking. The second portage at U 15 0345777 5650199 and the third at U 15 0346453 5650157 are just moose paths that run parallel to the north bank of the river. They are only needed at low water and can be entered and exited at any point that stream travel becomes impossible. I was able to use my brush pruners to cut away branches that made it hard to transport packs and canoes. We traveled along these for about 150 meters each. As we approached the no name lake a kilometer from the provincial border we threw some more rocks out of a long rocky trench that previous travelers had been clearing. The grandeur of that little no name lake was amazing. Rock walls up to 150 feet high highlighted with bright yellow birch leaves amidst the contrasting coniferous trees. There is a campsite a quarter of a mile east of the rivers exit from the lake. It is located on a point on the north shore up in the birch trees. A finer view you will not fine for miles around. We had spent five hours poling, pulling and portaging the three kilometers up the river and had two kilometers more before we reached Crystal Lake. Our group of three decided to push on to Crystal Lake. East of the no name lake we had to pull the canoes through boot sucking mud for about 200 meters to get to the 50 meter portage at U 15 0348150 5649654. This was a well maintained portage but on the other side the water level still forced us to pull our canoes in the shallow areas on the way to the final portage before entering Woodland Caribou Park. This portage starts at U 15 0348226 5649607 and it is best to continue past its normal end to U 15 0348464 5649697. There is a fresh 4 feet high beaver dam at this point so it is best to stay on the north bank until you get to it. The portage is still less than 400 meters long and lets you avoid a lot of hassle. The real bonus is that as long as it holds that much water there is good paddling all the way to the 100 meter portage marked on the Woodland Caribou Park map. After that portage there was just enough water to get to the 60 meter portage. I came to the 60 meter portage by continuing on the stream until there was a falls that blocked my way. The park map shows some small bodies of water in this area and the portage in a little different place than I found it. This could be from beaver activity in the area when the map was made. We pulled our canoes as close to the 30 meter portage as we could get and walked the north bank from there. On the return later in the week we found it easiest to combine the two portages by following the north side of the marsh grass that lay between the 30 and 60 meter portages. The total was still less than 300 meters and went smoothly. The 300 meter portage into Crystal Lake was the last of the day and definitely the steepest. We would sleep well that night. We proceeded down the lake about a mile and spotted a nice large wooded place to camp on the south shore. Camp was quickly set up before it got dark and we used the lantern to prepare supper. The Northern Lights were out again in the night.